This article explores a few ideas for reducing a keyhole draught. It also describes a unique brush keyhole draught excluder on the market for addressing this issue. 1) Some handle styles are available in a round rose lever version. 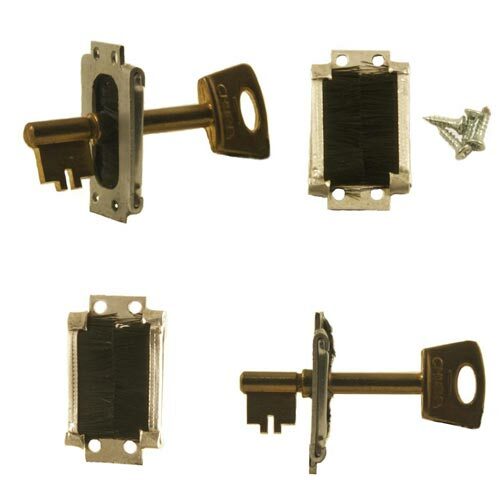 You can fit these in conjunction with a covered escutcheon and all your handles (or at least the levers) will match. On the negative side, removal of lock furniture may leave marks that need re-decorating, and whilst the styles will be coordinated, the two handle types are not an exact match. 2) Sometimes it is possible to block the keyhole on one side of the door underneath the handle back plate with something like adhesive duct tape. We would not advocate this practice because there can be situations where the key needs to be used e.g. for emergency or security purposes and blocking the keyhole will prevent this. 3) Leave the key in the door. Definitely not a good idea from the security point of view, all keys should be put away out of sight and not easily accessible. 4) Drill and fix a covered escutcheon onto the face of the handle back plate. A tricky thing to do successfully and they don’t tend to sit properly because of the small protrusion at the back on the hinge pivot. At Bernards Door Furniture Direct we have the ideal solution in the form of a brush keyhole draught excluder. In most cases these can be easily fitted underneath the handle back plate. This blocks the draught, but still easily allows a key to pass through. This is the perfect solution which is both discrete and energy saving. Typically only one will be required per door, but two can be fitted (one either side of the door) if the problem is extreme. Certain handles (e.g. cast iron) can be flat on the rear face of the back plate; in this situation it is necessary to recess the excluder into the face of the door.